Chives are far more than the little green bits on your baked potato—they have numerous health benefits that make them a worthy addition to a variety of dishes. Add to that the fact that they are easy to grow and maintain, and it’s obvious that chives deserve a place at your table. Chives (Allium schoenoprasum) are not the same as scallions and green onions (Allium fistulosum), though they are all in the onion or allium family, and are frequently confused. They are a perennial herb, meaning they grow back each spring, and have been cultivated for hundreds of years – not only for their culinary properties, but for their health benefits as well. 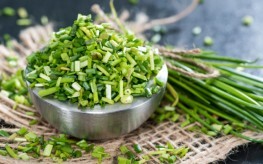 Chives are low in calories but relatively high in vitamins A and C. They also contain calcium, magnesium, choline, folate, vitamin K, phosphorus, and potassium. Vegetables in the allium family have been studied extensively for their health benefits. And while many of these studies focused on garlic or onions, some of the properties of these vegetables are similar simply because they are closely related. Some of the most promising studies have come from the treatment and prevention of certain types of cancer. It’s believed the anti-cancer properties of the allium family come from the organosulfur compounds within. One study, published in the Journal of the National Cancer Institute, found that men with the highest intake of alliums had the lowest incidences of prostate cancer. Several other studies have linked allium consumption with stomach cancer prevention. Because choline is a nutrition that aids in sleep, learning, and memory, chives and other allium vegetables may help regulate these things, potentially even fighting inflammation. The folate within may similarly ease depression, and regulate moods and appetite. Perhaps the best part about foods like chives is that they are easy to grow. They can be planted in early spring, as they are a cool-weather vegetable. The seeds will develop into harvestable plants within just a few months. Cutting them down at the base of the soil, you should get 3-4 harvest each season. Chives can be eaten fresh or frozen for use later on. They can also be dried, though they lose much of their flavor through the dehydration process. Add chives to soups, casseroles, egg dishes, and roasted vegetables. I love my chives. They come up so pretty and green every year and are delicious as well as nutritious.